Recorded as Hallock, Haylock, Hillock, and possibly others, this is a medieval English surname. It is just possible that it is residential from Hillock, a tiny hamlet in the county of Lancashire, although we have no proof as the surname did not exist in that county before the 19th century, or perhaps more likely was descriptive for a person who lived on a small hill or hillock. Surnames taken from natural features in the country side including the popular examples of Hill, Wood and Heath, were amongst the first to be created after the 12th century a.d. As to how they developed variant spellings can be put down to a combination of a lack of education, even by the year 1830 less than 12% of the population of the British Isles could write their own name, intermixed with strong local accents. This often lead to the creation of 'sounds like' spellings as nameholders moved around the country from the Middle Ages. 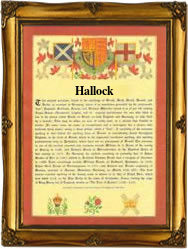 Today the spelling as Haylock is believed to be the most popular in England, although even this is rare. The city of London registers hold examples of the earliest church recordings and these include Testey Haylock, who married Bartholomew Redfern at St James church, Dukes Place, Westminster, on July 22nd 1589, and Rebecca Hallock who married Thomas Martin, on October 23rd 1682, at St James church, Clerkenwell. Thomas Hillock was a christening witness at the church of St Mary le Bone, on January 8th 1698.